Assistant Professor Sarah Rothenberg joined the College of Public Health and Human Sciences in September 2017. Before coming to Oregon State, Sarah was an assistant professor in the Department of Environmental Health Sciences at the University of South Carolina. She’s also held post-doctoral positions at the San Francisco Estuary Institute, the Institute of Geochemistry at the Chinese Academy of Sciences and New York University’s College of Dentistry’s Department of Epidemiology and Health Promotion. She earned a bachelor’s degree in Applied Mathematics, a master’s degree in Statistics and a doctoral degree in Environmental Science and Engineering, all from the University of California, Los Angeles. What made you decide to get into the environmental and occupational health field? Is there one specific moment that inspired your career path? “My background is quantitative, and my doctoral degree is in Environmental Science and Engineering. As a doctoral student, my research focused on mercury cycling in wetlands. 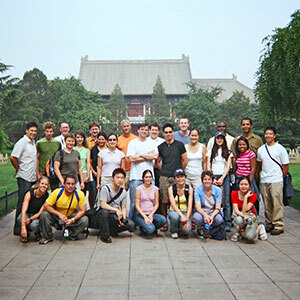 While I was a graduate student, I spent eight weeks in Beijing as part of the NSF Summer Research Institute in East Asia and Pacific. After this experience, I knew I wanted to return to China after graduation, where I felt my research on mercury was quite relevant. What does your current research entail? What sparked your interest in this topic? How does your work make a difference? What is the best advice you’ve ever received, and who gave it? What advice would you give to current students and recent alums? What are your favorite activities outside of work?